An individual formerly associated with Believers Church in India wrote to me about K.P. Yohannan’s letter to Calvary Chapel pastors. I have good reason to believe that this person is credible and has had access to the information I am about to share. In any case, if Believers Church’s officials want to contest this, I will glad print whatever they send. This individual expressed shock at the disclosure of Yohannan’s salary in the U.S. at $100,000/year. As an aside, former GFA staff who had direct knowledge of the payroll contest that figure by saying he made $120k in 2007. Whatever it is, $100k represents the bottom of the range. 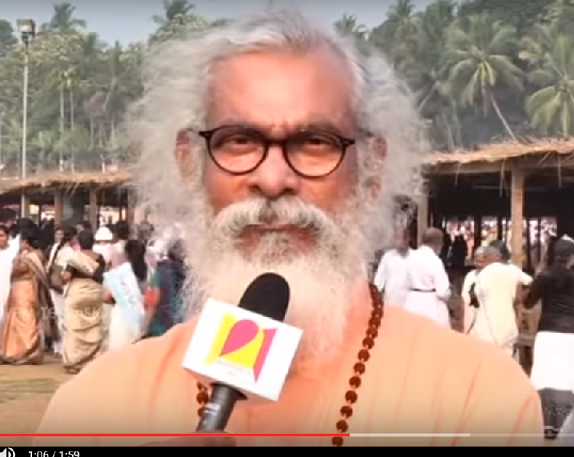 According to my Indian source, Yohannan’s salary is astronomical by Indian standards. 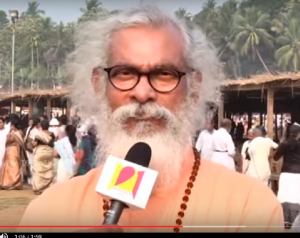 The source pointed out that the church pays for everything Yohannan does. My source said this revelation might be surprising to believers in Yohannan’s writings in Revolution in World Missions. According to this source, the most highly paid Believers Church bishops receive in the neighborhood of $12,000 annually. 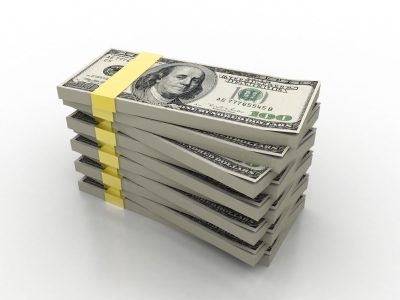 The source added that many missionaries in the field are only paid $40 to $180 per month. I have been told repeatedly by BC missionaries both current and former that these amounts require them to have other jobs to carry on their ministry. If these numbers are accurate, then a missionary is paid between $480-2160/year while their Metropolitan is paid at least $100k (perhaps more, no one seems to know if Yohannan gets paid for being Metropolitan). Believers Church Proverb: Thou shalt not muzzle the Metropolitan. Last night Phoenix Preacher published a letter to Calvary Chapel pastors from Gospel for Asia CEO and International Director K.P. Yohannan. I am not sure if it went to all CC pastors or just those who have had dealings with GFA in the past. I did get confirmation from multiple sources that the email message went to multiple Calvary Chapels around the country. Calvary Chapels, a movement associated with the late Chuck Smith, are especially important because so many of them support GFA. If you Google Calvary Chapel and GFA, you’ll find well over 100 CCs which support GFA in some fashion. I am still surveying CC pastors and attenders at this link. I have 53 responses as of now but would like a few more before I go with the results. Currently, most respondents are dropping support or never supported in the first place and are not inclined to start. Yohannan’s letter appears to be a response to growing unrest among CC pastors and congregations about the integrity of GFA. Michael Newnham at Phoenix Preacher commented on one aspect of the letter and I encourage readers to examine his comments about Yohannan’s treatment of former GFA staff. I will extend those remarks here. Below is the email with my comments and questions for Yohannan added. The entire email without comments is provided at the end of the post. Greetings to you. I am grateful to God for the relationship He’s given us over the many years. I appreciate your heart to reach the lost world with us, and this is why I am writing to you today. For the past several days, I have been ministering to around 15,000 believers who have been savagely persecuted and ostracized for their faith in Christ. These meetings were arranged well over a year ago and some believers traveled for days just to get to the conference location. Even with much happening in the US office at this time, I couldn’t cancel this trip and let them down. This sounds like quite a conference. I am surprised that a gathering of 15,000 persecuted believers didn’t merit an article in Christianity Today or the Christian Post or some other Christian publication, especially with the Day of Prayer for the Persecuted Church coming up. I would sure like to know more about that meeting. Even if everything Yohannan says here about a conference is true, that does not explain his silence before and just after October 2 when the Evangelical Council for Financial Accountability terminated GFA’s membership. The allegations rocking GFA have been public for months. Most of you are now aware that ECFA recently terminated our 36-year membership with them. I know, reasonably so, that this has caused great concern and raised questions about the integrity of Gospel for Asia and the handling of our financial matters. ECFA affirmed the funds given to the ministry were accounted for. We have honored our sponsors and donors designations. There were some processes and standards for ministry where we fell short of their standards. During the review process, which we are very grateful for, each time ECFA pointed out something that they felt we could improve on, we took it seriously and began to implement changes without delay. Yohannan says that ECFA affirmed that “funds given to the ministry were accounted for.” This claim is not enough. At least $90 million from 2012-2013 is unaccounted for in public records in India. Does the ECFA and GFA expect the public to simply take GFA’s word for it? Without some explanation, this isn’t enough for me,and it shouldn’t be enough for donors. What is not explained by Yohannan is why the ECFA board voted GFA off the island. If GFA did everything ECFA recommended, then why terminate the membership? Active termination of ECFA membership has only happened one other time since 2013. It is serious and requires explanation. Yohannan’s letter suggests that ECFA kicked GFA out even after GFA complied with ECFA suggestions. That is a big stretch and requires evidence. For starters, GFA should release the ECFA report. In retrospect, we realize that we have should have sought experienced outside counsel at times to help us in dealing with the complexities that come with a ministry of our size. To strengthen our ministry and further improve our processes, we are working hard toward becoming eligible to re-apply for ECFA. GFA’s eight board members are standing strong and aiding the ministry in these matters. Without some disclosure of what ECFA objected to, reinstatement to membership will erode ECFA’s credibility without doing a thing to build GFA’s status. GFA could really take a step in the right direction by releasing the ECFA report with a stated plan for how the board and leaders plan to correct the problems. It is surreal to read Yohannan’s affirmation of his board when three Calvary Chapel associated board members (Gayle Erwin, Skip Heitzig, and Damian Kyle) just resigned. In Erwin’s opinion, Yohannan kept the board in the dark about important issues including the related party transaction of $20 million from India to the U.S. for home office construction expenses in 2013. Yohannan ignores the fact that three board members just resigned with one of them accusing the CEO of misconduct. Furthermore, if his board is standing strong, where are they? Why haven’t they stepped up in public to offer full-throated support? A first step would be for GFA to identify those that remain. One question which raised concerns is in regard to the kind of church structure on the mission field. The structure (which is explained here: gfa.org/bc/about, is the result of God’s leading in the lives over 100 of our senior leaders in Asia, including myself. About ten years ago, after much prayer and fasting, the decision was made to register Believers Church with the Asian governments in order to gain the protection offered over the assets and work that many of you invested in, and that our missionaries and pastors here have given sacrificially to establish. For the sake of the Lord’s work and by His leading, our leaders on the field chose a form of church structure that is accepted by the government known as “constitutional episcopacy” (this is not the same as an Episcopal church, instead it is the governance of the church), which means the church is led by episkopos (bishops) (1 Timothy 3:1-2) and presbyteros (elders) (Acts 14:23). In order for any pastor to legally conduct weddings and other legal matters for the church, each one must be licensed by the Magistrate from the judicial system, or be ordained by a bishop of a church within constitutional episcopacy. Other churches operate in India without this structure. Regarding weddings, there is reason to question Yohannan’s statements. Christian and Hindu weddings are governed by different laws in India. According to the sources I have consulted (Indian embassy, and Indian government, see the links), no religious ceremonies are required and the legal aspects of marriage is handled by a Wedding Officer (link, link, link). In other words, religious ceremonies may be performed, but the legal recognition of a marriage is a civil matter. On the governance of Believers’ Church, one should consult the Constitution of the church which places K.P. Yohannan on the throne. Contrary to what he told his staff (he said he has no legal authority), Yohannan is on all church boards and is the final administrative and religious authority. Also, just so you know, the practice of ring kissing has not been taught or encouraged in Believers Church. The video of the pastor’s ordination being circulated about me does not show people kissing my ring, but rather them kneeling down to be prayed for and then touching my hand to their forehead, which is a very common cultural gesture of respect in India. I myself have done this many times. Neither ring kissing nor bowing and touching hands with foreheads are required by the Indian government. Whatever is happening in that video ceremony (and it looks like those ordained are kissing something), it appears to be an elevation of Yohannan to his Believers Church Constitutionally required status of “His Grace, the Most Reverend.” I will leave to readers to determine if Yohannan’s claim of humility is supported by the Believers Church Constitution and the video above. The expression and practice of worship in Believers Church are liturgical in form. This is culturally understood and accepted in South Asia, though it is a less common form of worship for evangelical denominations in the West. A typical church service in a Believers Church consists of 30 minutes of congregational worship, 40 minutes of systematic teaching through the Word of God with practical application, intercessory prayer and confession of the faith. While the expression is different, the substance remains the same. Our statement of faith, commitment to historical Biblical Christianity and philosophy of ministry remains unchanged. It is the governance of the church that has changed. Believers Church is in the unique position of having over 2.5 million believers, who speak nearly 300 languages, and of whom as many as 80% are illiterate. The interactive portion of the liturgy allows all to participate in the service, while reading through major portions of Scripture once every few years. It is the desire of Believers Church to keep these believers unified in the faith while growing in the Word and knowledge of the Lord. For more on Believers Church liturgy, see this description of the Communion liturgy. In my view, Believers Church is much closer to Anglican and even Catholic beliefs about Communion than to your average Calvary Chapel. We thought we were communicating effectively to you regarding these changes made to Believers Church and the reasons for it. We put up numerous pages on our GFA website. We hosted many, many Calvary pastors on the field and never hid our church from anyone. With some pastors we spent hours explaining the reasons for these changes; and we thought it was understood. However, we now realize, by comments made to us, that we did not communicate as effectively as we thought we had. We are truly sorry for this. Please know that it was not intentional. In the future we will work harder to communicate better. One place Believers Church was hidden was in the 2013 audit. GFA in Texas sent more to Believers Church than to GFA in India in 2013. While hospitals and for profit schools were going up with GFA money (an Indian court affirmed that donor money was not spent as intended), GFA failed to disclose that millions was being sent to Believers Church. There are some former staff who have been quite vocal in expressing complaints they have against my leaders and I. We have taken this seriously and actively sought, according to Matthew 18, to reach out individually to these former staff members to ask for forgiveness. As leaders, we would agree that we have not always represented Christ in the right way. But our conscience is clear before God that we have always tried to. And we continue to try. We have not disclosed the “other side of the story”; the personal lives of many of those whose testimonies have been shared. Some of them we spent hours counseling out of addiction and sin. Some of them we fasted with, prayed with and wept with during times of personal struggles and family tragedies. We have protected them and their reputations. God knows, and in fear of Him and of judgment we will continue to pray for them. In one small paragraph the GFA Diaspora and others who have left the group are slandered with the vilest of faux pietistic innuendo as addicts and sinners and are implicitly threatened with disclosure of private pastoral issues. Thus, all their accusations and information are dismissed. They are no longer brothers and sisters, but sinners and addicts who cannot be trusted. There can be no more wicked and evil abuse of ecclesiastical authority. This is an abomination to God and His church. This tells you every thing you need to know about K.P. Yohannan. This is an unprincipled attack on former staff and not an appropriate commentary about the merits of their complaints. Yohannan leaves it up to the imagination of the reader which staff are addicts, and which are serious sinners, thus impugning their character. Some people have asked if my lifestyle is different in reality than what I have written in my books. I’ve even heard people saying I live in a mansion and drive around in a classic European sports car! In reality, my “European sports car” is a restored 1962 VW bug which I bought 19 years ago for $1800. My wife drives a Honda HRV. In my life I have taken a total of 4 family vacations. I currently have one house in the Dallas area that I am trying to sell. It’s in a nice neighborhood hardly two minutes from the previous location of our ministry. It’s about 3,000 square feet, has 4 bedrooms, my office and my wife’s office. In Asia, the only house I live in is owned by the church. It’s about 1,400 square feet. Some pastors have seen it during their visits to India. My salary is set by the Board of Directors of Gospel for Asia. It is about $100,000 per year, including housing allowance. My wife and I don’t need that much to live on, but this is what the Board decided to give us. We give a significant portion of it back to the ministry. I have never taken any royalties from the 250 books I have written. Although I have been called foolish for not taking them, writing books has never been about the money, but about reaching the lost world and encouraging the saints. This is the way I have chosen to live my life. Like you, I try to hear from the Lord and do what He asks of me. Many former staff contacted me about this point. A former staff couple told me that they were required to live on half of Yohannan’s salary with a much larger family. Another family of four was paid one-third of Yohannan’s wages. Some qualified and received WIC benefits to buy milk and supplies for young children. Others had to go on the insurance exchanges to get health insurance. Many staffers I have spoken with told me they were not able to save and had to ask for extra money from their own accounts when needs came up. Yohannan mentions his books. Recently, I spoke with two of Yohannan’s ghostwriters. Bill Bray told me earlier today that he wrote “every word” of Revolution in World Missions back in the mid-1980s. Yohannan was involved and Bray interviewed and spoke with Yohannan and his wife frequently about the content but, according to Bray, Yohannan did not do the writing. Another ghostwriter said 13 books were penned by taking notes and sermons and putting them into manuscripts with Yohannan’s name on them. I await Yohannan’s comments about these claims and will be glad to print his rebuttal, if he has one. I have attempted to live before God and man humbly and faithfully. There have been many times that I have fallen short and failed. But I ask God for forgiveness and make things right with those who allow me to. And I look forward to the day I will see my Lord face to face. If you have any specific questions for me, I would be happy to talk with you. You can also direct your questions to my leaders, Daniel Punnose, John Beers or David Carroll. I have included all our email addresses below. Well, apparently, I can’t direct my questions to the GFA trinity. But then the letter was addressed to Calvary Chapel pastors. Despite the fact that GFA’s non-profit status requires them to operate in the public interest, the public’s interest is only welcome if they are giving GFA money. For now, I will again say that I will publish any evidence or comments GFA cares to provide. I have always done so. What I won’t do is simply accept statements without evidence and ignore discrepancies that are unexplained simply because you claim to be doing ministry. Click here to read the email without interruption. However, in public records in India, only about $6 million was reported received by Gospel for Asia – India. Gospel for Asia Canada reported about $15 million sent to India in 2013. Nothing was reported as coming from Canada in the public records in India. 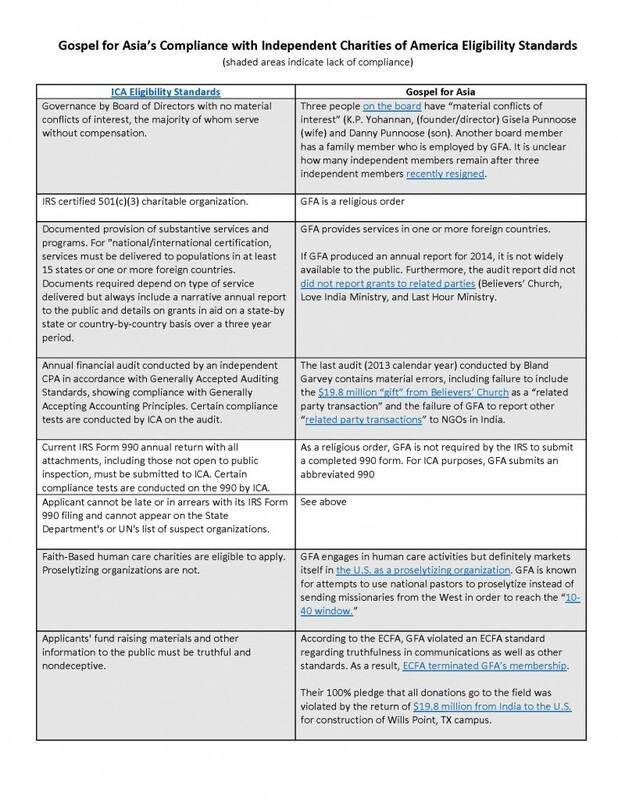 Although unreported in the audit, GFA also sent millions of dollars to NGOs in India, Believers’ Church, Love India Ministry, and Last Hour Ministry. Counting those funds, the total accounted for goes to about $37 million. Thus, about $21 million is unaccounted for from the U.S. office. The figure grows to $36 million if one adds the Canadian money which doesn’t show up anywhere in India. Another analysis looking at income from all sources worldwide estimates about $47 million unaccounted for in 2013. The bottom line is that the funds that GFA claimed to send from the U.S. and Canada do not show up in the Indian records available. Despite repeated requests, GFA has never offered an explanation. A person concerned about GFA spoke to a representative by phone and asked for information about the unaccounted for funds. The GFA representative told the caller that my blog posts had only found and reported the amounts given in the Indian state of Kerala. According to my source, the GFA rep said my figures did not include funds sent by GFA to NGOs in other Indian states. So I checked the other states. I looked through the reports in every state for donations to Believers’ Church, Gospel for Asia, Love India Ministry, or Last Hour Ministry. I even looked for Bridge of Hope, Operation Mobilization and Good Shepherd Church (OM-India and GSC are friendly to GFA in India and have received small grants from GFA). I found nothing. No funds were sent from GFA-US or Canada to these organizations in any other Indian state according to public records available. So now, back to you GFA. This really should be easy. You said in your audit that you sent $58.5 million to GFA-India. However, GFA-India reported only about $6 million. Why didn’t you report the related party transactions which went to Believers’ Church, Love India Ministry and Last Hour Ministry? And where are the funds that don’t show up in the records of any of the four NGOs? This should not be hard. Remember, it isn’t your money. In a mailing just received today, Gospel for Asia’s fund solicitation still carries the Evangelical Council for Financial Accountability seal. The letter is dated October 15, which is nearly two weeks after the ECFA board voted to terminate GFA’s membership. Along with the ECFA charter member seal, the pledge card carries the meaningless ICA “Best in America” Seal. According to the ECFA standards, this GFA mailing violates Standard 7.1 which relates to “Truthfulness in Communications.” According David Carroll, GFA’s COO, GFA will seek membership in the future. Continuing to violate a standard doesn’t seem like the best way to make a case for reinstatement. By continuing to claim membership in the ECFA, GFA is in violation of ICA standards and the standards for qualification as a charity for inclusion in the Combined Federal Campaign. The Office of Personnel Management’s standards also require truthful materials. In June 2014, the head of one of Ted Cruz’s Super PACs, David Barton visited Ukraine and, among other things, told a group of pastors that John Locke’s Two Treatises cited 1500 Bible verses of how government should operate (recently debunked with the help of Greg Forster). According to his Facebook page, Barton went back last week to spread the Christian nation gospel. We’ve been in Eastern Europe this week. This country is wanting to move toward a new constitution that inculcates many of the principles of our American constitutional government, including its alliance with religion and morality. I spoke at what is considered their premier university and law school, and then met with some heads of their departments. We are also helping with the development of military personnel and programs here, including the addition of chaplains to the military (some of our best and most-Godly military leaders will be helping them over coming weeks). During the trip, we dined at a local restaurant, and we captured some of flavor of this wonderful country and its precious people in the video below. (They even played a western swing song — quite an interesting sound on Eastern European instruments!) The panoramic picture is of a law class where I spoke at the university, and the large red building is a university here. There is also a choir singing inside a government building (the yellow room in the picture) as part of our awards ceremony, and then the group of 55 special students from across the country we honored with awards last night for their contributions to the movement to create a new constitution here — one built on Godly values and the rule of law, modeling much of the original intent of the American constitution. I spent 2 hours after the law school yesterday speaking to these students, and then answering their questions. They were a remarkable and bright group — a great future for this nation! 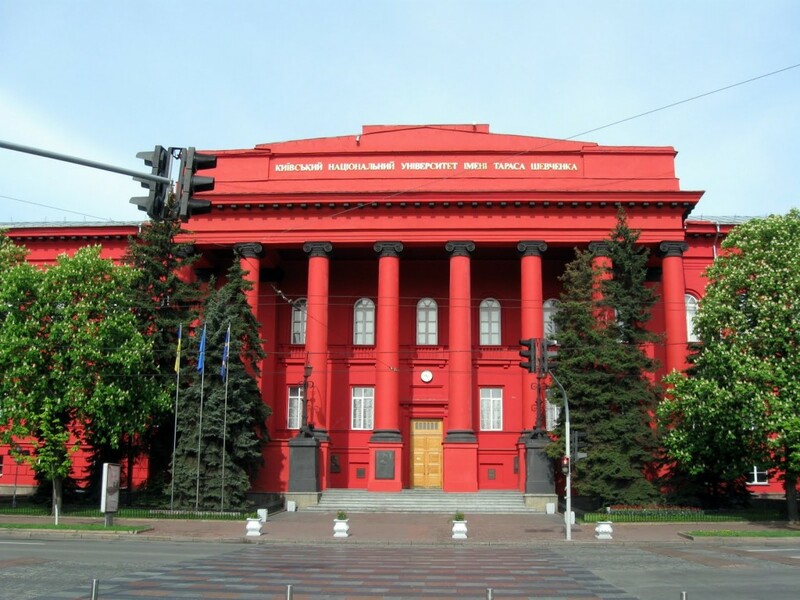 Judging from one of the Facebook pics, Barton spoke at the Taras Shevchenko National University of Kyiv. Hopefully, Ukraine will have some politicians and citizens who advocate for principles in our actual Constitution, not the make-believe one Barton claims quotes the Bible. To those contemplating a Ted Cruz presidential run: Consider that Barton runs one of Cruz’s Super PACs and has been a long time Cruz supporter. How does a Secretary of Education David Barton sound? Ambassador to Ukraine? Gospel for Asia is participating in the Combined Federal Campaign going on now. This campaign allows federal employees to give via their paychecks to charity. For some charities, this is a windfall; for others it brings in enough to make it worth doing. I give GFA credit for not including the ECFA seal on the recent promotional literature aimed at federal employees (see a part of it below). However, the rest of it is brazenly and tragically misleading. If GFA operated with the highest standards of financial integrity, the organization would not have been kicked out of the ECFA. GFA’s leaders would answer donor and media questions. Financial matters wouldn’t be shielded behind excuses. GFA’s CEO K.P. Yohannan would be available for comment. If GFA operated with the highest standards of integrity and accountability, celebrity pastors (yes, you Francis Chan) would state publicly what your position is regarding GFA. You have removed your endorsements from the GFA webpage, but you told Christianity Today you are still on the GFA board. 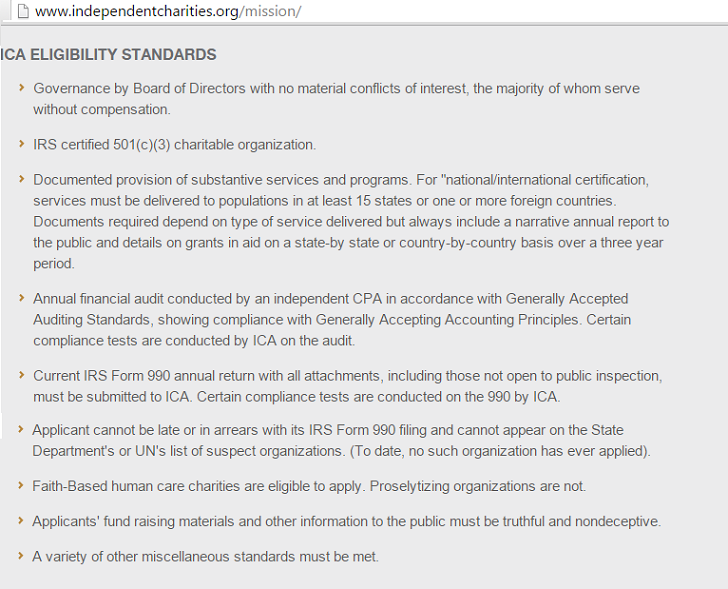 GFA now banks on the Independent Charities of America Seal of Excellence to claim the “highest standards.” However, GFA paid ICA and Maguire and Maguire a little extra to use it. Maguire and Maguire make money when donors give to GFA through the CFC. So it is to ICA’s and Maguire and Maguire’s advantage for GFA and other charities to look good with the Seal given by MM/ICA for pay. David Barton, the leader of one of Ted Cruz’s Super PACs, said on his Wallbuilders Live show today that the Iran treaty requires the U.S. to fight anyone who attacks Iran. Barton is pretty sure Israel will do it so the Iran deal obligates the U.S. to fight with Israel. Say what? Ok, readers who are up on the Iran treaty issue, what is this about? According to RWW, Trump first mentioned this and the State Dept denied it. However, we all know that some people won’t be satisfied by a simple denial. Does anyone know what provision of the treaty Barton is talking about? Better yet, Mr. Barton, I know you read here, so tell us. Quote the provision. What is your source? Here is the treaty. What page should I read to know what you know? 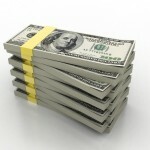 Does Independent Charities of America Bring Value to Donors? 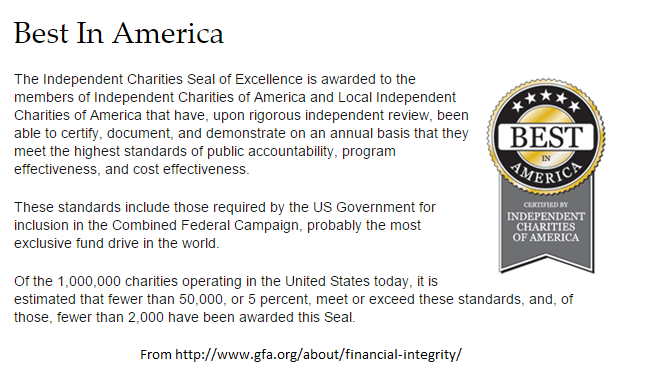 Ubiquitous on charity web sites is a ribbon-style seal that in large type reads “BEST IN AMERICA,” features five stars across the top edge, and indicates that the charity awarded the seal is “certified by Independent Charities of America” (ICA). Many donors may view such a seal as a reflection of how efficiently a particular charity will use their donations, and assume that it represents an independent endorsement of a charity from an outside organization. 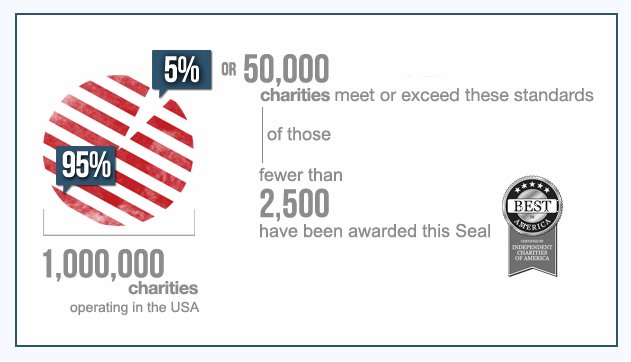 While ICA may refer to its member charities as “Best in America,” some donors may be disappointed to learn that ICA is funded by the very charities that use its seal, and that ICA generally does not screen charities for financial efficiency. Any money that goes to ICA is money that won’t go to poor children or mission work. Whenever someone gives to a charity through the appeal of ICA, a percentage goes to ICA and their association manager Maguire & Maguire. Like Gospel for Asia, ICA refuses to answer questions. I asked ICA if the 2,500 number represented the number of charities that chose to pay ICA for the use of the Seal but got no answer. Since ICA uses the same criteria as the Office of Personnel Management, I believe the 2,500 are those who pay the fee to use the Seal. In other words, it means nothing extra in terms of quality or efficiency. Another way to look at it is that 47,500 charities would rather put their money toward services as opposed to paying for a meaningless image on their webpage. Perhaps the Seal could be renamed Seal of Excess. We know one charity (GFA) kicked out of the ECFA (a rare happening) which pays to create a false impression. 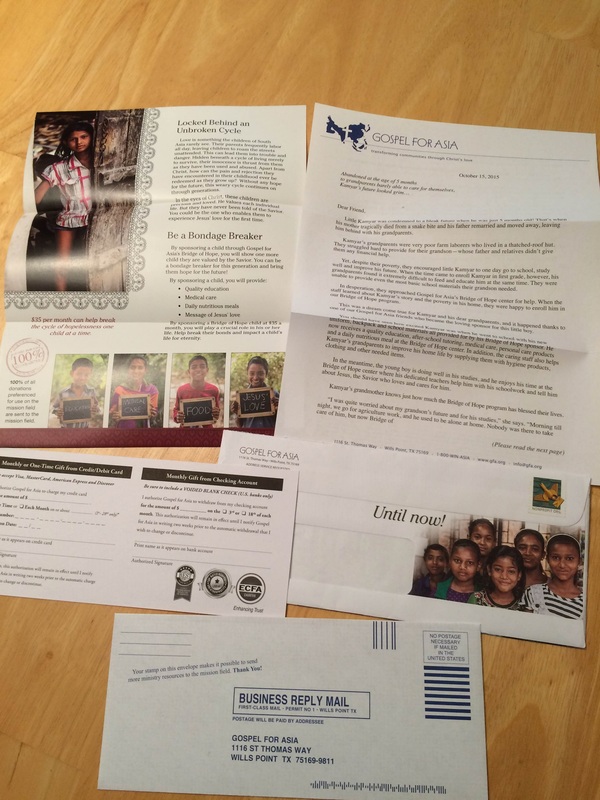 Author Warren ThrockmortonPosted on October 23, 2015 Categories CharityTags Gospel for Asia, Independent Charities of AmericaLeave a comment on Does Independent Charities of America Bring Value to Donors? 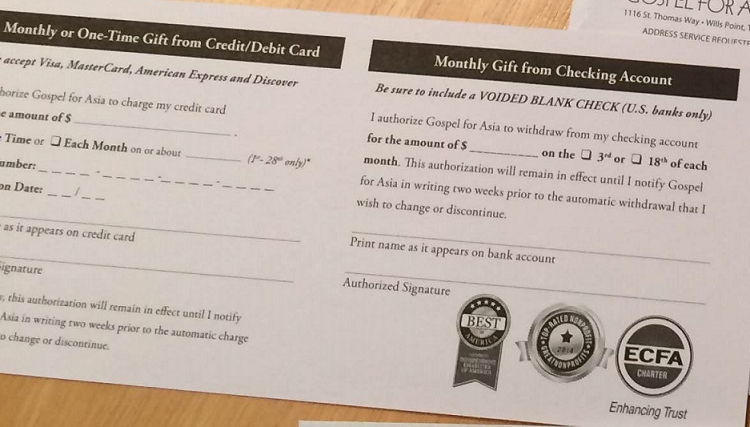 Now that the Evangelical Council for Financial Accountability has terminated Gospel for Asia’s membership due to violations of multiple standards, GFA is using the Seal of the Independent Charities of America as a badge of financial integrity. When I called the ICA, I was connected to Mike May with Maguire & Maguire, an association management firm. May told me that organizations approved by the Office of Personnel Management for inclusion in the Combined Federal Campaign are allowed by ICA to display the ICA Seal. GFA is approved as a charity for the 2015 campaign in progress now. Beyond explaining ICA’s use of CFC approval, May had no comment about any of the other questions put to him. At this time, I don’t know why ICA has the restriction on proselytizing organizations or why GFA, as a proselytizing organization, is allowed to display the Seal of Excellence. In any case, my research, the recent actions of the ECFA and the recent statement of former board member Gayle Erwin call into question the compliance of GFA with most of the eligibility standards of ICA (and more basically with the federal standards for participation in the Combined Federal Campaign). Click the image below to go to a pdf chart with supporting links. ICA is now aware of the discrepancies between their criteria and GFA’s performance and it remains to be seen if ICA will investigate or take any action. Board Members Quit Floundering Teen Mania; Will Gateway Church Continue Support? World magazine reported on October 17 that half of Teen Mania’s independent board members resigned. I am linking to World’s coverage of TM as an alert to readers that the former high flying ministry is in free fall. TM continues to break commitments and is going deeper into debt to various groups, some of whom are suing. Top Ten Charities in trouble; note that TM is #5. Part two and part three are available on You Tube. This is required reading as well. I don’t care how much good TM claims to do (e.g., Acquire the Fire is for the most a big pep rally for God), the mistreatment of teens that is glorified by TM in the msnbc documentary is enough to shut the whole thing down. Despite light coming to the situation, some groups continue to stand by TM. One such group is Gateway Church and The Kings University. TKU actually gives academic credit for TM’s Honor Academy. This should be an embarrassment for TKU. Robert Morris endorses TM, as does K.P. Yohannan. Author Warren ThrockmortonPosted on October 21, 2015 Categories Believers Church, Charity, Gateway Church, K.P. Yohannan, Robert MorrisTags Gateway Church, Robert Morris, Ron Luce, teen mania, The Kings UniversityLeave a comment on Board Members Quit Floundering Teen Mania; Will Gateway Church Continue Support?